Sailing is learned through experience. 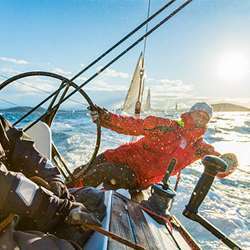 Whether you're a complete beginner or a sometime sailor, this 7 hours sailing experience will teach you to sail safely and confidently as you learn about the basics of sailing. Grab your sandwich, favorite snacks and drinks to enjoy a full day sailing adventure around beautiful Prince Islands of Istanbul with our Protected content Year ~ 46 Feet Bavaria sailing boat. If you are already experienced in all or any of the beginner's subjects you can simply join us to practice your skills. Istanbul, the land of 4 gorgeous islands called Prince Islands side by side on the waters of Asian side is an absolute paradise for passionate sailing enthusiasts in all seasons. Taking a sailboat along the coast of the Prince Islands is a truly unique experience, which includes typical island cottages & historical buildings of significant importance, beautiful evergreen pine forest covered hills, quaint taverns, cute island harbors, some of the indigo waters unique to Bosporus and private beaches of the Marmara Sea. Without nature, we would not even be sailing. Therefore, embark on that sailing trip and enjoy yourself, look around you, take deep breaths, appreciate the nautical wonders of nature. The ocean beneath you, with your sailboat cutting through it as the wind blows into its sails, and the blue sky above – I certainly discovered a feeling that can only be described as an overwhelming appreciation for this beautiful planet we all share. Our instructor is a very experienced sailor & an outside the box thinker. It is quiet interesting to listen to his thoughts on sailing classes and other general courses we deal in Turkey from his perspective. Yes, simple as that, sailing improves health, both mental and physical. The sounds and motion of the sea splashing and swooshing, the sailboat’s rhythmic movement and the winds’ sounds always put you in a laid back mood. The scientific explanation would be that your body produces serotonin, which results in a good mood, while the spiritual explanation would be that blue waters bring you a sense of wellness and peace. Now, sailing is often dynamic as well, and you have to act quickly, and this will help you learn how to multitask efficiently. A sharp mind can be the most powerful tool. Physical benefits? Active sailing will build your endurance and muscle strength. The hosting and pulling of sails to a yacht will keep you fit. It lowers your risk of obesity, hypertension and improves your cardiovascular system. Dropping anchor in one of the spectacular islands for a break during the sailing trip will definitely be a highlight of the whole sailing experience. "Just living is not enough... one must have sunshine, freedom, and a little flower". Join us for all the physical & spiritual benefits that sailing offers.